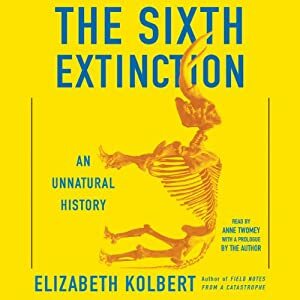 At first, this book made me feel guilty for the extinctions that humans have caused. But then I realized that we are a kind of invasive species too. Is it really our fault that we developed minds and then tools capable of carrying us around the world? Had we any idea of the destruction that we would cause? No. We were just doing what any species does - procreate, expand, and diversify. I also feel that Kolbert was catastrophizing a bit in her book. Although humans have certainly caused a lot of damage to our planet, I don't think we are capable of destroying a world that has survived so many other massively destructive events. We are just another blip in the planet's development. I have wanted to read this. It seems to be one of those really important and about the state of humanity and the world. I agree that humans are not likely to destroy life on Earth, however, we may make it uninhabitable for us. Yes, I have no doubt we'll make it uninhabitable for many species. But I doubt total destruction. I guess I won't be around to know if I'm right or wrong, though.